The United States has been working to remove North Korea’s nuclear and ballistic missile capabilities since President Clinton’s negotiation of The Agreed Framework in 1994. North Korea went against this agreement and continued nuclear development, leading to the creation of the Six Party Talks. These talks consisted of North Korea, South Korea, the United States, China, Japan, and Russia working in a multilateral framework to negotiate an end to the North Korean nuclear and ballistic missile programs. These talks stalled in 2009. North Korea’s nuclear and ballistic missile programs have continued despite numerous sanctions levied by the United Nations and unilateral sanctions imposed by the United States. Reports from April 2017 indicate that North Korea is poised to carry out a sixth round of nuclear testing. According to the findings, tunnels were excavated in January 2017 in the mountain range North Korea uses for nuclear tests. In late March, water was pumped out in preparation for measuring equipment necessary for nuclear testing. Analysts were concerned that a nuclear test would occur on April 15 during celebrations for the 105th anniversary of Kim Il Sung’s birth. In response, U.S. officials announced the dispatch of a U.S. Navy strike group to the Sea of Japan. This envoy did not arrive in the area until April 25 due to previously scheduled exercises with Japan. North Korea did not end up conducting a nuclear test in April, possibly as a result of the Trump administration’s military posturing. Other exercises, however, have continued. North Korea unveiled new models of intercontinental ballistic missiles (ICBMs) during a military parade on April 15. A medium range missile was launched on April 15 from a North Korean submarine in the Sea of Japan. The test failed shortly after launch. North Korea conducted live-fire artillery drills on April 25 to celebrate the 85th anniversary of the founding of the North Korean army. Another missile was tested on April 28, but this also failed shortly after launch. On May 14, 2017, North Korea conducted a successful missile launch. This missile was an IRBM (intermediate range ballistic missile) and traveled around 430 miles before landing in the Sea of Japan. While the distance the missile flew was unusually far for North Korea, the altitude it reached is even more concerning. The missile was able to reach an altitude of about 1,200 miles before “mimicking the kind of fiery re-entries a nuclear warhead would undergo if fired over a much longer distance.” Analysts estimate this missile would be able to travel 3,000 miles if it was fired on a normal trajectory. This test “[represents] a major technical success” for North Korea. The UN Security Council released a statement on May 15 condemning the missile launches from April 28 and May 14. The UN Security Council admonished North Korea for its “destabilizing behavior” and demanded that North Korea immediately cease all nuclear and ballistic missile tests. In 2016, the South Korean military announced the U.S. would install a Terminal High Altitude Area Defense (THAAD) system in South Korea. The system is intended to defend South Korea by tracking and targeting incoming missiles within a range of 125 miles. The THAAD system was expected to be installed by July – September 2017 but was deployed earlier than planned, in May 2017. It is possible the early deployment was in response to increased tensions in the region and due to concerns regarding possible changes in policy under new South Korean leadership. The U.S. military pushed forward with the deployment of THAAD, even over objections. Some in South Korea are protesting the rollout of THAAD due to concerns this will make South Korea even more of a target. More protests were raised following Trump’s statement that South Korea may have to pay for THAAD, although U.S. officials later reaffirmed the U.S. would be paying for the system. China is also opposed to the deployment of THAAD due to concerns the powerful radar will be used to spy on their air space. China punished South Korean businesses in China ahead of the deployment. The recently elected South Korean President Moon Jae-In has made arrangements for a dialogue between Beijing and Seoul to discuss China’s concerns over THAAD and the larger North Korean problem. President Moon reportedly told Chinese President Xi Jinping that “pressure and sanctions [should be] used in parallel with negotiations” to resolve the North Korean nuclear issue. President Moon’s election platform included: engaging in a dialogue with North Korea, being firmer with the U.S., and reviewing the possibility of reinstating a “Sunshine Policy” that would encourage economic relations with North Korea. President Moon’s policy of economic engagement with North Korea may undermine U.S. efforts to sanction North Korea over their missile and nuclear programs. Previous attempts to negotiate a cessation of North Korea’s nuclear program have all failed. Efforts by President Clinton in the 1990s ultimately failed when North Korea was revealed to have nuclear weapons in the early 2000s. The Six-Party talks spanned six years and achieved only temporary concessions from North Korea. North Korea has backed out of agreements time and time again. There is no way to guarantee that any diplomatic solution will be adhered to by North Korea, leaving some to question the efficacy of renewed talks. Despite many in the international community encouraging dialogue, the Trump administration has not taken military action off the table. Secretary Tillerson has previously stated that pre-emptive military action in North Korea is a possibility. In late April, North Korea threatened to launch a “super-mighty preemptive strike” if the U.S. continued military operations in the area. In response to heightened tensions, the Chinese Foreign Ministry has issued several statements encouraging caution. The Trump administration is also considering the use of new sanctions to deter further nuclear testing by North Korea. The U.S. House of Representatives passed legislation on May 4 targeting North Korea’s shipping industry and labor exports. The sanctions will not be put into place unless the U.S. Senate also passes the legislation. The United States and China are currently negotiating additional sanctions which will be brought forward to the UN Security Council. However, new sanctions from the UN will not be effective unless China enforces them fully. Some analysts believe the Chinese government does not properly enforce current sanctions. China has halted coal imports from North Korea, but the amount of trade between the two countries has already increased since last year. A reduction of Chinese trade would likely be more effective than any additional sanctions the U.S. could impose on North Korea. In late April, Secretary Tillerson claimed China had warned North Korea it would enact unilateral sanctions if North Korea went ahead with nuclear tests. The Chinese Foreign Ministry, however, downplayed these remarks and never confirmed the claim. China is unlikely to impose unilateral sanctions against North Korea as they have traditionally followed a policy of noninterference in other countries outside of UN action. China’s reluctance is also in part due to concerns for the stability of the country as China faces the threat of a humanitarian crisis should North Korea become destabilized. China has a difficult choice between ensuring their own security and the security of the region. China’s ability to deal with this issue is jeopardized as North Korea continues to shift away from Chinese influence. Many U.S. politicians overestimate the amount of power China has over North Korea. Since 2009, China has been unable to wield sufficient leverage to entice North Korea to continue the Six Party Talks. Engagement between leaders has also declined. For example, Xi Jinping and Kim Jong Un have not yet had a direct meeting. Another sign of the deterioration of their relationship is the criticism of each other in their state medias. In February 2017, North Korean media wrote veiled criticisms of China after all exports of North Korean coal to China were barred in response to missile tests. More recently, North Korean media wrote criticisms directly accusing China of violating “the independent and legitimate rights, dignity and supreme interests” of North Korea in response to Chinese state media calling for the denuclearization of North Korea. 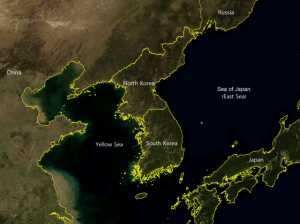 Recent events have exacerbated the tenuous security situation in the Korean peninsula. It is in the best interest of all parties to come to a solution peacefully. The U.S. and China need to find a way to balance their competing priorities to focus on their shared goal of deescalating tensions.